David Powers King: Warming up to Writing: Where I've Been For A Year! Warming up to Writing: Where I've Been For A Year! Greetings, friends! It’s hard to imagine that I've being away from the blogosphere this long without an update. Rest assured, there were reasons. I'll out point what's been going on since the year started. 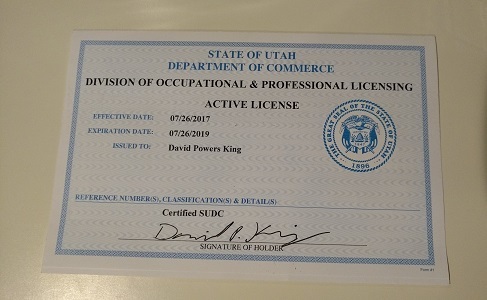 First, by some miracle I passed the substance abuse counseling program with high marks, including the licensing exam on the first try! If the fate’s allow, around this time next year, I will be a fully licensed counselor in the field of substance abuse. I never imagined my personal journey would go in this direction, but I have to say this experience has opened a new world with excellent developments. Now I'm a substance abuse counselor by day and a writer by night! Second, we welcomed a new member into our family in April, who will be known on the blog as Girl 2. She's such an adorable addition! Third, Woven is available in THREE languages (English, Portuguese, and German)! Ravensburger did an amazing job encapsulating the spirit of the story with its German cover; totally spellbinding. It’s been an honor watching our story weave its way to three continents. Speaking of weaving, here’s a bit of news for those patiently waiting for a Woven follow up. A working draft of Woven 2 (title pending) is finished with two rounds of edits done. It won’t be long before we pitch this addition to the world of Woven. And it's not a typical sequel like most of us are accustomed to. We hope to share more soon! Woven 2 - complete final draft and submit to our publishers. My Zombie Summer - finish Part 2 and begin Part 3. Anthology - releasing this fall with one of my short stories. HistFic project - my grandfather’s MS has been transcribed. Space Opera Saga - return to my first books, shape them up for today’s audiences, and see if we can't find a home for them. Blogging - new content monthly, starting now. And of course, if you'd like me to showcase your books, feel free to contact me here. That’s the nutshell’s take on the last year away from this corner of the blogosphere. There is another element to my absence; now is not the time to get into that, but I feel it is something important to share later. I know I’ve said it before, but I will say it again and again: thank you for your patience!!! A little more time is all I need to start this journey anew and become the writer I’ve always wanted to be. That's cool your book is in three different languages. And good to hear the sequel is getting even closer. Congratulations on everything! Seems you've had a productive year so far. Hope it continues that way. Congratulations on the new addition and your other succ3sses. Huh. Sounds like you've been bored stiff. "Girl #2" is indeed a little doll. Welcome back Sir David. I'm puzzled, how do you know they've done a good job with the translations unless you speak those languages??? It's great that they have been translated though. Congratulations for all. Your little one is adorable! The covers are awesome. Congratulations and i am so glad you are back with that sweet darling added! Welcome back and congratulations, Sir David! That baby girl is really lovely. And the German cover is very cool. Welcome back David! Can't wait to read more!!! Oh she's so cute. I can't wait to meet her!!! Welcome back! Your sense of humour is still wonderful (re: return of the king/trunk full of pizza). Congratulations on the translations of Woven, that's really exciting to hear. Best wishes for all the writing to come! Welcome back! I have taken time off myself and finally am returning. Congrats on everything that has come into your life! Glad to see you back. Sounds like you've been busy. In a good way. Congrats. Congrats on everything and welcome back. Welcome back! Can't wait for more books from Sir Knight! Congratulations! So many new things for you to celebrate. Congrats on the new career! Girl 2 is beautiful. So glad you are getting back to writing and blogging, it has been a long time. Good luck with Woven 2. Welcome back and congratulations on getting so much done. Substance abuse counselor has many challenges, but I'm sure you will be an excellent one. Welcome back, David!! You've got lots of good reasons for taking some time off. 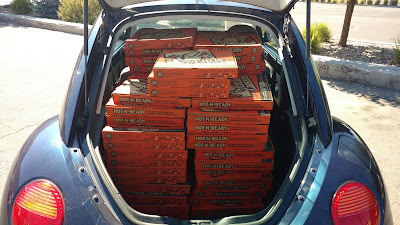 Can you believe I already knew what a trunk full of pizzas looked like? Welcome back. I just returned from my 8 month absence renewed and ready to do this thing we call being an author. It is great to see you again and all the things you have in front of you. Glad to see you've returned. You've been pretty quiet for awhile. Whenever I pass by Kingdom City and the Iron Skillet when I'm traveling down to the Ozarks of Jefferson City, I think of you! hey David. Welcome back! Saw you at my blog. Congratulations on the new job and that 'sweet' adorable addition to your family. You may have found the perfect balance :) Golly, still have your book 'Woven' on my bookshelf to read! Need to activate that plan ASAP. I've since published my book, The Shells of Mersing with Evernight Teen. Not a fantasy like yours, but an exciting contemporary adventure. If you read, please give a boost. Thanks! Your daughter is beautiful, David. Congratulations to you and your family! I look forward to reading more updates from you.